You probably have everything you need to make these in your store cupboard. No need for any cream either, so you can make them easily whenever you need a chocolate fix. Now I'm not saying you need to eat all five at once. I find one is enough, but it's much nicer than a jar of Nutella and a spoon. I came across this technique by mistake. Let's call it a happy accident. There will be science to explain it, but you'll have to look elsewhere for that. Probably something about the change in the molecular structure. I was melting dark, dark chocolate at the time, in a bowl over a pan of simmering water. It was beautifully glossy and oh so tempting. I decided to use some maple syrup to sweeten my new recipe. I added it to the melted chocolate and it immediately thickened. Not what I needed for my recipe but I wasn't about to throw out a bowl of chocolate. 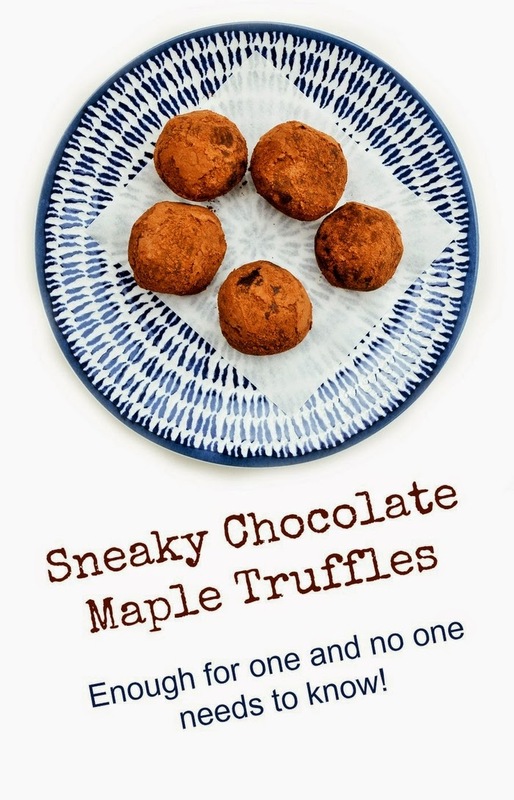 I tasted a little and realised it was the texture of a rich creamy truffle and was delicious. So I covered it and popped it into the fridge while I melted some more chocolate for my recipe. I finished making my new dessert (look out for it next week!) 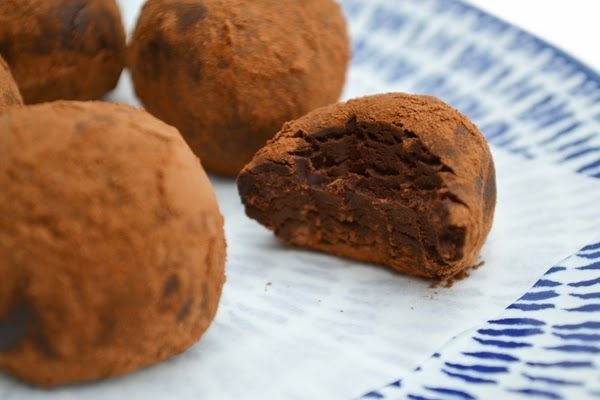 then took the truffle mixture out of the fridge, rolled balls of it in cocoa and popped one in my mouth. 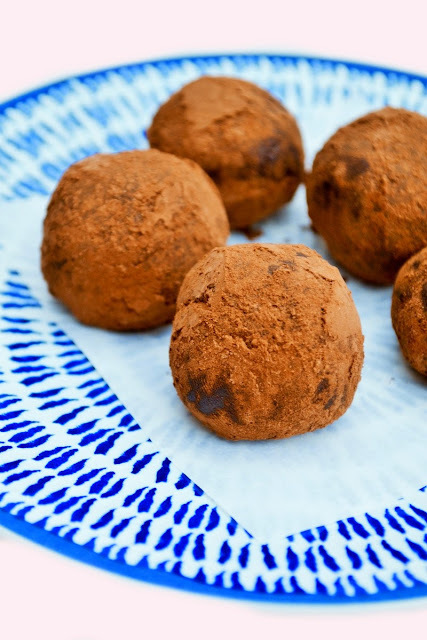 Five chocolate maple truffles for chocolate emergencies. 1. Melt the chocolate in a bowl over a pan of gently simmering water. Make sure the bottom of the bowl doesn't touch the water or the chocolate will be ruined.2. Mix together the maple syrup and vanilla.3. Take the chocolate of the heat and stir in the maple syrup. 4. Watch it thicken. Cover and pop in the fridge for 15 minutes.5. Roll 5 balls of cocoa and then roll them in cocoa.6. Pop one in your mouth and the rest in the fridge. Quick they are dangerous! Too tempting! Notes: Take out the fridge a while before you want to want to eat them as they do harden up. Haha, glad it's not just me, although usually I am fine, but there are those moments. Now I shall be breaking into my baking stash where I hide the good chocolate to make these. Oh that is ideal then Jen! It was Angela & one I'll definitely be making again. Ha haa, that's totally the best kind of serendipity! Isn't it! Great it involved chocolate too. I think if I made these I'd scoff all five in one go! They sound amazing! What a happy accident!! So interesting how the chocolate thickened up like that. I wonder if milk chocolate would do the same? Truffles for one, I am so into that Jacqueline. That's a very happy and good mistake to make!